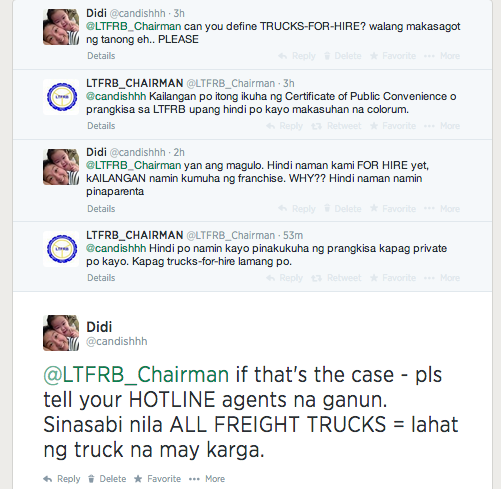 UPDATE: August 9, 2014 - As of 10:53PM LTFRB Chairman Ginez made a Tweet that said that they are RECALLING THE PETITION OF EXEMPTIONS FOR PRIVATE OWNED TRUCKS. This means THAT IT IS NO LONGER NEEDED!! Please click the link below to see the actual TWEET!! Finally! LIGHT AT THE END OF THE TUNNEL!! When I was told this - I was like, WHAT?! Are you serious? We have green and white plates simply because it is PRIVATE! Yellow plates for private? Are you kidding? I remember when I was small that the distinguishing mark for a private vs a public vehicle is the color of their plate! My dad told me a story that a truck of his friend got caught because it was not sporting a yellow plate. Also they were caught because the goods inside their trucks were not their 'real' products according to the enforcer! And you know how much the fine is? P200,000.00 !!! Yes - it was THAT much!! This alarmed me and made me really curious on the topic. I began googling 'Private Trucks Yellow Plates' - but to no avail - there was no ONE news that talked about it. There were forum topics but not one addressed to this one topic. It was very vague to be honest. Me: Even if the truck is privately owned and private used for the company's delivery of its products? Me: Can you define what FRIEGHT TRUCKS mean? 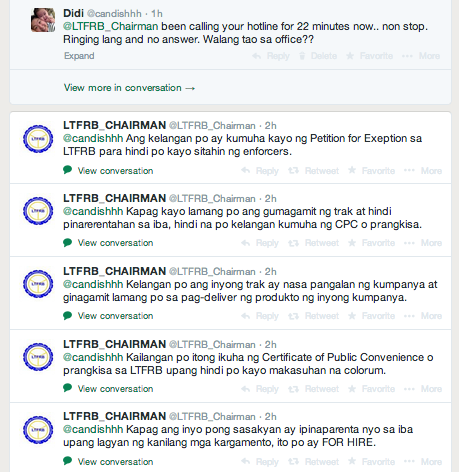 I then decided to TWEET the LTFRB_CHAIRMAN - to test if I would get a reply. I checked on his last tweet and it was quite a while ago. But I took my chances - malay mo diba? I got shocked when I got a reply! Hahaha.. And here is what we tweeted to one another, I'm sorry but this is what I captured. I don't understand too why it's not organized. Weird! So that's how it went. I'm sorry its a bit confusing - but I'm sure you get the gist of the conversation. Twitter has this sort of ewan for chronological order of conversation that I don't understand. 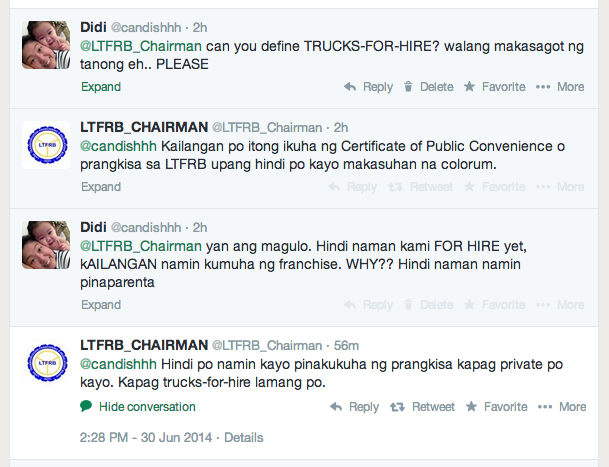 Anyway - according to the LTFRB_CHAIRMAN twitter account - private vehicles DO NOT NEED to get the franchise/CPCs. After calling and calling for almost an hour - I finally got on the phone with Warren. I relayed to Warren my issue and he said that Maan was able to discuss it to him this morning. Aba! Efficient nga talaga si Maan! He said that he understood my concern that PRIVATE trucks need not get the franchise license BUT according to his superior Ms. Lilian Coloma - we SHOULD JUST GET IT, JUST TO BE SAFE. What?! Just to be safe? I then asked him - was it NEEDED or not replied with 'Ma'am apply nalang po kayo para hindi po kayo masita ng ibang entities' What are those other entities? There's the MMDA, PNP and etc. Waaaaah!! He also shared that the new price is ONLY for the LTO and LTFRB - as for the other entities, their current rates still remain! Ano ba ito?! Yes, that is what ran through my head the entire conversation. There is no ONE entity that can be followed - its every man/entity for themselves! Free for all! Napakalaking WTF?! Yes, this is OUR government, this is the Philippine Government! He understood where I was coming from but based on his superior - that was the only thing he can recommend. I had to put down the phone because the conversation was leading nowhere. I called Maan to relay to her that I was able to get through and speak to Warren, but she wasn't around. I spoke to Krisha and also told her the entire story. I told her that if I were to choose, I would believe the tweet that I got from the LTFRB_CHAIRMAN because it says that private trucks need NOT get a franchise. But I was doubtful of its veracity since most twitter accounts are handled by 'secretaries'. I then told her to just relay to Maan what happened and that I asked for a call back. I got a call right after, it was still Krisha and she told me that the twitter account of LTFRB_CHAIRMAN was really the chairman himself answering tweets! I was dubious, but she said that Chairman Ginez is very active is social media - and that we has the one who replied to my tweets. So I guess, I will quote Chairman Ginez on his tweet! I hurriedly screen captured it - it might get deleted you know!! Krisha told me to make a formal letter of clarification - so that they can relay to their bosses. And so I sent one through email. Let's see how long it takes to get a reply of some sort. I have to say - I am most impressed with Maan and Krisha and how they handled the call and how well they conversed with me. Their english is very good, they were warm and they understood what I was telling them. I did not need to repeat myself. For once, I got to speak to a government employee that has very good listening skills! I am very happy with that. So there, I am sharing with you my plight. I think most private companies have this same question hovering over their heads for a while now. Even if there is a 30-day suspension - we still need to be clarified on this matter because securing all those documents? Gosh - they take time and have their corresponding fees too! So, if we can save some dough and time - why not, diba? 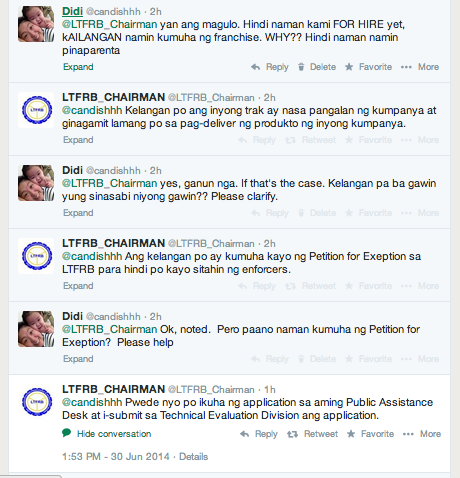 As of August 8, 2014 - I have not heard from the LTFRB Chairman on anything. I sent my letter through DOTC but I guess it has fell on deaf ears. Anyways, I was listening to the radio and the MMDA Chairman Francis Tolentino was the guest of DZMM's Pasada 630 - he mentioned that he has been in the talks with Chairman Ginez about the NOT-FOR-HIRE trucks. He was explaining that small businesses - not engaging in a truck-for-hire scheme, should not be even asked to apply for an EXEMPTION - simply because they are engaged in another type of business! Why should these businesses be hassled to submit their SEC papers, DTI papers and charged a fee for something that they are not engaged in. He has a very good point - because he said - that this particular exemption is up for abuse! Some companies may apply for this exemption (since its cheaper) than get a real francise! Politics and miscommunication - hay! Shouldn't they have stales about these things before releasing the implementation? Who approved of such? Sigh.. Dito talaga sa Pinas - hilahan pababa - at pataasan ng ihi. Sheesh! I so believe in that - na the front liners should be knowledgeable - it says a LOT about the company eh. Dapat naman talaga LAGOT the managers and visor kasi they're the ones who train e. Dito sa Manila, I am all for proper training - but I think our citizens are so used to the 'bahala na' attitude that the quality is almost always sacrificed. Sad. This blog is very helpful...thank you miss didi...nagulat din kasi ako sa biglaang pagpatupad nito. Ang laki pa naman ng multa. Actually, ok naman na itaas ang multa para magtino ang mga operators. Pero yung mga pribadong truck na hindi naman pinarerentahan - wag na nilang isama diba? Ang gulo kasi e. Pati tuloy sila, naguguluhan sa mga ini-akda nilang batas.. Toink! thank you for this blog. This verified what my driver repeatedly telling me that they were harassed many times already for not having a "yellow plate" despite being a private company truck. I was flabbergasted with the issue because i for one read and watch daily news to be updated with everything and never have i come across with this issue beforehand. I even got mad at my driver for letting him be fooled and taunted by the officers and even told him that if it happens again that he be sure to call me and i will be the one to talk to the officer. so ANyway, after reading your inquiry details and blog, I am still confused what should be done. I got lost after the "just to be sure get one" part. so based on the new rule, we should get one or is it just a "just to be sure" idea? Not blaming you, answers you got were going no where with no definite answer. Hi Anonymous! I am as confused as you are. According the the tweet of the LTFRB Chairman - there is NO NEED. But according to his staff - we need to get it just in case. I sent a formal letter of clarification and I'm still waiting for the reply. But until then, I will trust the tweet of the LTFRB Chairman. Siya mismo nagtweet eh. I hope you can share how you got the Certificate of Exemption. according to their hotline, even if your truck is not for hire, and yet you have 2 businesses using the same truck. this is considered trucks for hire??? I don't know if you can consider it as truck for hire. If you as me, it's not because there is no 'service charge' for it diba? Hope you were able to sort it out!! Thank you so much for the information, this clarifies the issue in my mind. Hi Gie! I hope I was able to clarify, kasi honestly - the post is open-ended parin eh.. I think I was able to shed some light, kahit papano!! On December 13, 2004, the LTFRB issued the attached MC- 2004-043 ordering all Owners/Operators of private vehicle classified as TRUCK or Van to secure “TRUCK-FOR-HIRE FRANCHISE”. However vehicles use exclusively in furtherance of owners own business may file Petition for EXCEMPTION. While these circular was set aside and modified by MC-2009-013, the present BOARD is incline to REINSTATE MC-2004-043 in fact they are now accepting Application for EXEMPTION with additional requirements. On June 2, 2014, DOTC issued a Joint Administrative Order 2014-01 raising the penalty on TRUCKS without franchise ”COLORUM” to Php 200,000.00. The implementation of said JAO-2014-01 was set on June 19, 2014. 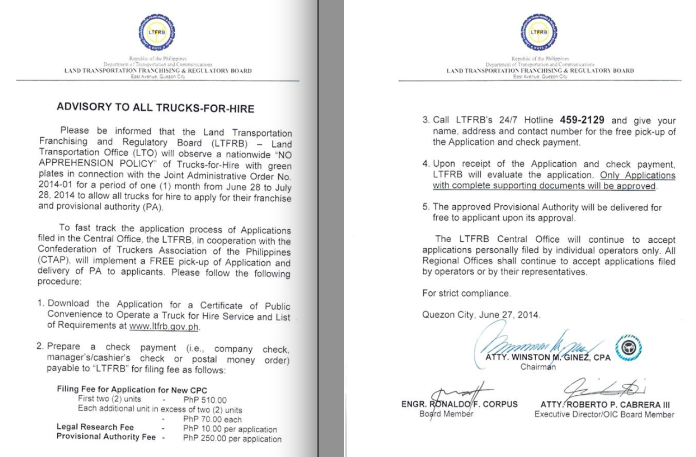 However, pursuant to the attached “ADVISORY TO ALL TRUCK-FOR-HIRE” issued by the LTFRB on June 27, 2014, the implementation of JAO-2014-01 was suspended until July 28, 2014, to allow truck operators to secure provisional authority. In the event that you have already filed an application with the LTFRB, and you don’t have a lawyer, we are offering a package deal of (P4, 000.00) per unit which includes from preparation, hearing, presentation of Documentary Exhibits up to the release and issuance of Decision. Don’t wait to be apprehended and avoid to be penalized, you still have time to have the Certificate of Public Convenience and continue your Business. For further inquiry and clarification Email us at electionagent@yahoo.com or visit us at the above address or call Cell number 09215774598 Landline 5461068. Thank you and have a good day. Hi Law Firm, Please don't use my blogpost to advertise. But wala na akong magagawa..
Namemera lang ba? I am confused on the memorandum also.. Can you shed light? Ang dami talaga paraan ng gobyerno para mangotong o gatasan ang mga mamamayan na panay pawis para makaipon ng pera, kung ano anong penalty ang ginagawa. Dati sa sales invoice, yung pinapalit ang format pero sa totoo lang sablay din naman yung ginawa nila. Imbis na kaunlaran ang inaatuapag ng mga ahensya ng gobyerno ang ginagawa nila, panay money making scheme nalang at pahirap sa mamamayan. Sa totoo lang, sa ibang bansa, mas malupit pa ang paraan ng gobyerno na buwisan ang mga mamamayan nila. Dito sa bansa natin, labo labo ang batas at maraming loopholes. Okay lang sa akin na magbayad ng buwis - basta't nakikita natin ang improvement sa bayan. Just went to lto and ltfrb earlier. They insist that all delivery trucks without franchise is colorum and will be apprehended. Does that mean all private trucks should apply for the exemption? I as confused as you are Anonymous! But I will take the tweet of the LTFRB Chairman that we don't need a franchise. I talked to an agent here in Cabanatuan City and they advice me to go to a lawyer for a letter requesting for an exemption (our trucks are not for hire) and then go to the LTFRB Regional Office in Pampanga to get the application and file for the exemption. Any idea how much for the filing of the exemption? Kailangan daw ng exemption kasi kung hindi huhulihin daw... and you know how those entities are out there-- wala silang patawad no matter how much explanation you tell them. They rule the road out there. Btw, thank you for posting this blog. It helped answer all the questions i have in mind. Thank you for your kind words. I am still confused to be honest. There was an extension though - walang pwedeng humuli hanggang August 29, 2014. Hi Ms. Didi. Thanks for your blog on this. You have made the circuitous leg work easy for us in connecting to a very elusive contact lines that goes on and off, over and over again with some right, wrong and maybe who persons on the other line. At least it is clear from the statement of the LTFRB Chief that Private Delivery Vehicles, Not For Hire, but used in the furtherance of private trade need not get Franchise. Now, let me ask if it is necessary to put "company name and address, gross/net weight, totsl passengers" markings on the side of the driver's door? Hope you have already encountered this question. I know it's mandatory BUT that was years ago. The new trucks of my in-laws, parang I don't recall seeing such. Maybe you need to ask the LTO about it! very helpful. me memo na application for exemption for this now ko lang nalaman nun sinabi ng car insurance company..
Really may memo na for the application of the exemption? Where can we get copies? Wala sa LTFRB website kasi. thank you for posting this blog, i was also confused about this issues.. Like you my naka usap din ako from LTO naman sya pero di rin malinaw ang sagot nya sa akin. He asked me to go directly to LTFRB office...we are also a private company using NOT FOR HIRE trucks..
Hi Grace! I hope you've read my blog post!! This has been RECALLED!! Meaning - HINDI NA NATIN SIYA KELANGAN!! yahoo!! in agricultural sector HAULING CANE trucks kasama kaya sa Yellow PLate? please advice me pardon my IGnorance. Is there anyone here who have already applied for a "Certificate of Exemption" and received their "Certificate of Exemption" I want to see how it looks like and I want to know how long it took. When I went to the LTFRB almost a month ago to submit a letter requesting for said exemption (together with the documents required under the guidelines), I was advised by the public assistance desk that application must be prepared by a lawyer because it is a Petition. Therefore, any notion that it is free or easy to apply for an exemption is not true. Hello! Please be happy to know that this application thing has been RECALLED!! One of the very best options for trucks owners will be to closely adhere to a fabulous routine maintenance schedule. This single action can have such a beneficial affect on the dilemma of needing to make repairs to any commercial vehicles. Although routine maintenance cannot prevent every problem, it will certainly go the distance towards having breakdowns of such trucks be a quite rare occurrence. Thanks for the post! Do you know any trucking business philippines?